Afghanistan’s new regime has expressed unhappiness over India’s delay in supply of military hardware as it grapples with intensified Taliban attacks ahead of the U.S.-led NATO troop drawdown from the war-torn country. Giving an indication of new government’s policy towards India, Advisor to the Afghan President, Daoud Sultanzoy said the relationship between the two countries will be based on “reciprocity” and that New Delhi can play a vital role in ensuring peace in the region. Afghanistan has been trying to revamp its military to fight the resurgent Taliban as NATO forces are due to withdraw from the country by December 31 after 13 years of fighting. He also indicated that it may have a relook at the “inventory” depending on its needs. 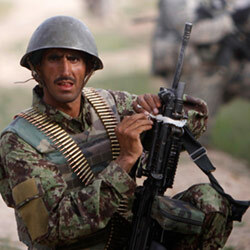 Around 12,000 NATO forces will continue to assist Afghan forces after the troop drawdown. Mr. Sultanzoy who handles foreign policy in the new Afghan establishment, said there may be a re-examination of the defence inventory sought from India by the previous government of President Hamid Karzai. “Because of change in our leadership, there will be some new evaluation and then after that we will probably have a new inventory of our needs and if India can play continued role, we will welcome it and we will make sure that we take advantage of it,” he told PTI in an interview. Mr. Sultanzoy was part of Afghan President Ashraf Ghani’s delegation who participated at the recent SAARC summit here. Mr. Ghani and Prime Minister Narendra Modi had a bilateral meeting on the sidelines of the summit. Asked about India’s role in Afghanistan, Mr. Sultanzoy said New Delhi sees a strategic interest in the country and asserted that any change in ties would be for the “better”. “India is not our strategic partner just because of us. India sees its own strategic interest in Afghanistan and we have to reciprocate and see reciprocal advantage in India’s friendship and if India can play that reciprocity,” he said. On whether Mr. Ghani will protect India’s interests in the country, he only said the government will protect everybody’s interests as long as Afghanistan’s interests are protected. India has been providing transport, logistical and engineering equipment to Afghanistan and training its security personnel in India. “Afghanistan has always said that it will protect everybody’s interest as long as our interests are protected. It is a very mutual phenomenon, cooperation between states and the region. And we are determined to safeguard that cooperation,” Mr. Sultanzoy said. Mr. Sultanzoy also hailed Mr. Modi’s initiative to have better ties with neighbouring countries and said India’s better relationship with Pakistan may significantly improve stability in the South Asian region. “I think it’s a very important step and much awaited step. We wish India had done that long time ago. India’s relationship with Pakistan, India’s role in the stability of the region that stems from its cooperation with Pakistan can play a huge role in the future of the whole region. “I think the Prime Minister’s vision and his efforts are very very welcome and I hope that it will be reciprocated by Pakistan and we look forward to be an added factor in these efforts. A is very much interested in seeing this cooperation expand,” the senior Afghan diplomat said. India has invested $2 billion in aid and reconstruction and trained scores of Afghan officers but has been careful in supply of arms and military hardware for fear of provoking Pakistan as well as armed groups in Afghanistan. Asked whether Pakistan should do more to dismantle terror infrastructure in that country, Mr. Sultanzoy said all the countries must put in concerted efforts to end the menace as it “sees no borders”. “Terrorism and violence have been depleting very important energy of the region. This is something that all countries that have been affected. This is not just an Afghan issue, it’s not an Afghan phenomenon. But Afghanistan is the victim of the violence and it has proven that it has no limits and sees no borders,” he said. Asked about push by certain countries to make China a permanent member in SAARC, he only said both China and India must work together to ensure stability in the region. “China is a very very important country in the region. China and India are two countries which are major population centres in the world. Therefore they command a huge amount of clout in terms of consumerism, in terms of middle class capabilities, in terms of their productivity, economic and otherwise and in terms of the need for raw material and energy. “So if both countries are in this region and cooperate, they will both create a path for stability which will be beneficial for the region,” he said.